Removable trays can be set aside for short periods, allowing for normal eating and cleaning. Enjoying an apple without the intrusion of brackets and wires works well for many patients. Plus, the smooth plastic surface offers a comfort level to the tongue and cheeks unequaled by other forms of straightening. Committing to consistent wear at least 22 hours each day helps ensure the success of your treatment. While clear aligners work extremely well for adults, a responsible teen can be a candidate too. 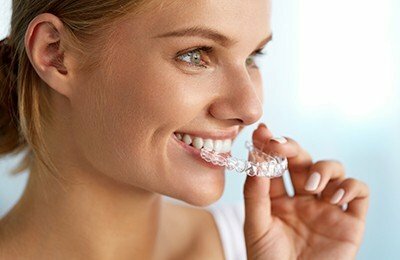 Adults of every age have discovered the perks of straight teeth with aligners! While aligner treatment works for 90% of straightening cases, some requested tooth movements may not be possible. Other patients may prefer the added security of fixed braces. Today’s orthodontic options offer more choices than ever. Our in-house orthodontist can help you discover the path to a straighter smile. You may discuss adding whitening to your treatment plan as well, removing years of yellow stain accumulation. In some cases, the beauty of porcelain veneers can lift a straight smile to another level or may even offer an alternative to orthodontics. The smile you’ve always dreamed of may be closer than you think with flexible payment options and more insurance plans than ever choosing to cover clear aligners as an acceptable method of orthodontic treatment. Check with our dental office today for more information.